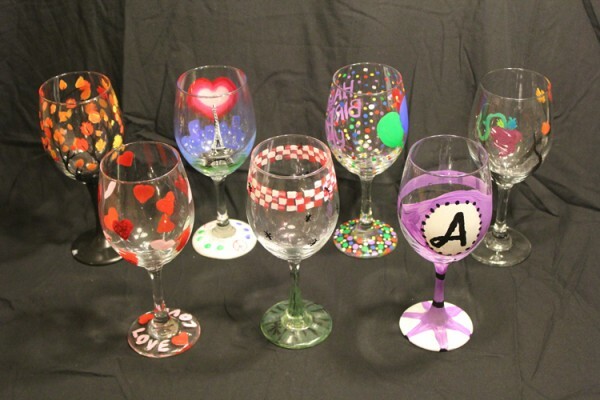 Paint and Pour is now offering something new… Wine Glass / Glassware painting! Guests can paint wine glasses / beer mugs / other glassware with their own fanciful designs and take them home. Our Artists will help you choose your own unique design, and be available to help with advice on color and technique. Come with an idea or the studio will have several samples for you to refer to for inspiration. We provide each painter with 2 peices of glasseware (choose a set, or mix-and-match), as well as the various brushes and art supplies required to complete the project. Bring in your friends and a bottle of wine, and make it a party! *All glassware selections are on a first come, first served basis.